WATCH Microwaves cause of US embassy workers' illness? The "health attacks" on American personnel in Cuba have perplexed U.S. investigators and medical teams for months now -- but despite recent reports that researchers are focused on microwaves, there is still no "prime suspect," the doctor leading an investigation tells ABC News. Nearly two years after the first U.S. personnel reported symptoms, the investigation into what caused them and possibly who is behind them remains ongoing. 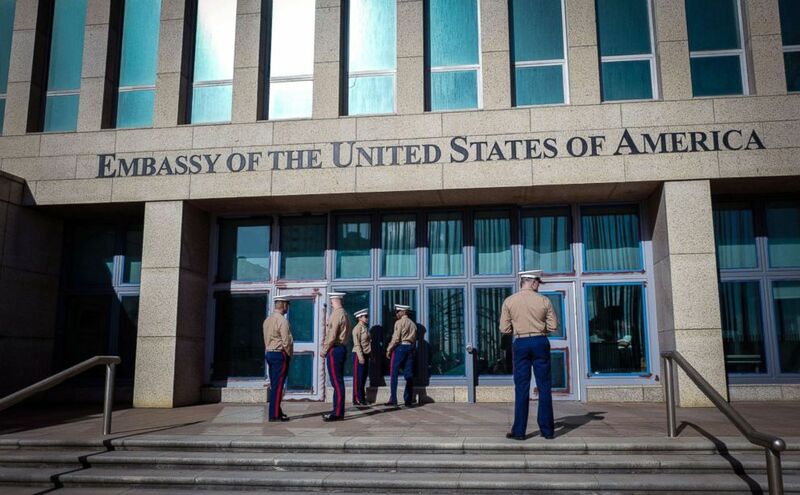 Now, with one medically confirmed case at the consulate in Guangzhou, China, and possibly others there, the challenge of solving this mystery has only grown, even as the State Department takes steps to slowly rebuild the embassy in Havana. The evidence suggests the attacks were not by a sonic weapon, as reported when the illnesses first came to light. Instead, the screeching or buzzing sound embassy employees reported hearing was a "side effect," according to Dr. Douglas Smith of the University of Pennsylvania, who said it could be a hint at a different kind of "exposure" the affected individuals experienced. A total of 26 Americans working out of the U.S. Embassy in Havana have now been medically confirmed to have symptoms consistent with mild traumatic brain injury or brain network disorder. But Smith, who heads the Center for Brain Injury and Repair and leads the team that has examined 21 of the affected individuals, says they still do not know what kind of exposure is responsible, with microwaves one of a handful of possibilities. "Yes that's on the list, but we haven't determined it is the source," Smith told ABC News. That matches what the State Department has said, too, with an official confirming to ABC News Tuesday, "The situation has not changed: There is no known source or cause." Led by the FBI and the State Department's Diplomatic Security, the U.S. investigation "is working diligently to determine the cause of the symptoms, as well as to develop mitigation strategies," another official said Monday. Another leading researcher is arguing the symptoms of U.S. employees "are consistent with the effects of RF/MW," or radio-frequency/microwave radiation, in a forthcoming paper in the medical journal "Neural Computation." Dr. Beatrice Golomb of the University of California, San Diego, said the experiences are also similar, with individuals hearing targeted sounds like chirping or ringing and reporting sensations like pressure or vibrations. The majority of the U.S. workers who Smith and his team studied and reported hearing a noise also said they experienced a "pressure-like" or "vibratory" sensation. Golomb's study follows a similar one in February by Dr. James Lin of the University of Illinois, who argued the public accounts of personnel's experiences seemed to match "a targeted beam of high-power microwave pulse radiation." To help determine the source, Smith and his team are now using advanced MRI technology to study the white matter of these individuals' brains. "Since this group looks like concussion patients, we are studying their brains to see if there are similar kinds of changes in white matter. If that's the case, that might point to the source," he said. White matter is the tissue in the brain that contains nerve fibers that connect brain cells and is responsible for transmitting messages between different parts of the brain and the body. Marines stand outside the U.S. Embassy in Havana, Cuba, Feb. 21, 2018. Those U.S. personnel were confirmed to have debilitating symptoms such as cognitive difficulties like memory loss or inability to concentrate; persistent trouble sleeping or seeing; headaches and balance problems; and auditory problems like tinnitus and hearing loss, as detailed in a Journal of American Medical Association report by Smith and his team published in March. In July, JAMA published four letters critical of that study and arguing that mass hysteria could be responsible for the reported symptoms. Cuba has denied responsibility for the illnesses, at times also casting doubt on whether they are real. But Smith pushed back strongly against the idea of mass hysteria, saying each patient went through a series of neurological exams, "some of which are impossible to fake," with several specialists who are "uniformly all convinced there is something there -- what we call brain network disorder." The team's MRI study hopes to provide evidence of brain matter changes to dispel that idea entirely. The National Institutes of Health and the Canadian government are conducting replication studies to verify Smith's team's results, he said. About half a dozen Canadian citizens have been similarly affected, but sources tell ABC News they were likely collateral damage in attacks on Americans. After weeks and months of recovery and rehabilitation, including cognitive therapies, all the personnel Smith has worked with have shown improvement: "There were some people who had spontaneous improvement," including some who improved before they saw his team of doctors, he said, but, "Others without rehabilitation would have continued to suffer substantially." Still, it's unclear who in Cuba would have this kind of weapon that could inflict this damage, especially since it has now affected one employee at the consulate in Guangzhou, with symptoms "consistent with what happened in Cuba," according to Secretary of State Mike Pompeo. State Department officials have told ABC News that Cuba must know who is responsible, given the country's surveillance state, but they have not ruled out others' involvement, including Russia. Smith told ABC News he was aware of "a lot of research, escalated in the past few years, to use energy weapons to take down drones" or other aircraft and to put words in people's brains, but no one had been successful on that yet. Last week, the State Department announced it had taken some steps following an Accountability Review Board investigation into its response to what former Secretary of State Rex Tillerson had called "health attacks." The review found "significant vacancies in security staffing," a lack of resources in department's Bureau of Medical Services, and "some challenges with information sharing," but overall it rated the response as "adequate and properly implemented." A handful of steps have been taken since to strengthen the response to the issue, including a point person to handle the issue and liaison with the affected personnel. One major change is moving the remaining U.S. employees in Havana into fewer residences, a State Department official told ABC News. The State Department ordered a drawdown of its personnel last fall, citing the health incidents, and there are now only a dozen or so employees working at the embassy. For months that restricted staff has been unable to provide full consular services for American citizens and no visa services to Cubans -- and the State Department even warned in a travel advisory that U.S. citizens could be affected as well in a travel advisory. But after a "thorough review," the State Department quietly lowered that advisory a week and a half ago to its "Level Two: Exercise Increased Caution," an official confirmed, essentially admitting there was no evidence private citizens had been targeted. The embassy is now also providing the full array of U.S. citizen services because of staffing changes, but there are no plans to increase staffing at this point, a State Department official told ABC News. The embassy is currently led by an interim Chargé d’Affaires, Mara Tekach. Previously a Deputy Assistant Secretary of Western Hemisphere Affairs and Minister Counselor at the U.S. embassies in Mexico and Haiti, Tekach replaced Philip Goldberg, an experienced ambassador who only took the post in February. Tekach, who as the deputy chief of mission was elevated to chargé on July 20, is said to be in the post for longer-term than the six-month rotations of her two predecessors.